BSL-3-Ag and BSL-4 are among the most demanding laboratory environments. These labs must meet rigorous standards in regard to engineering the primary and secondary containment systems. BSL-3-Ag and BSL-4 facilities also have a range of additional requirements relating to separation of facilities, structural durability, biosecurity, procedures and administrative controls. 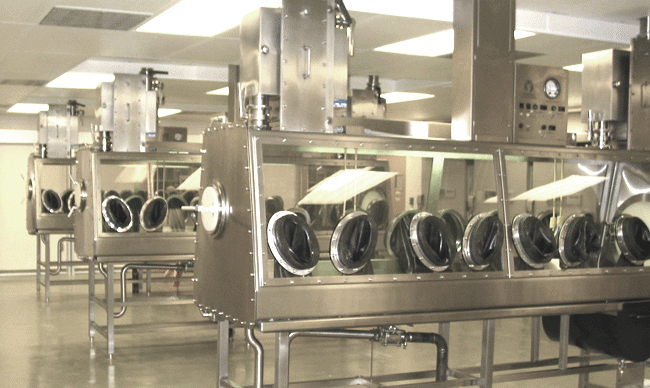 Germfree has been manufacturing bio-containment equipment for more than five decades. We have delivered complete modular BSL-3 and ABSL-3 laboratories worldwide. Additionally, we have engineered and manufactured components and casework currently being utilized in BSL-3-Ag and BSL-4 facilities. 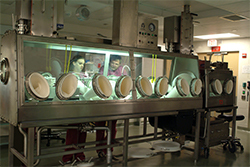 We build advanced Glovebox Lines (Class III Biological Safety Cabinets) designed and engineered for any demanding application. These include systems for All Hazard Receipt Facilities (AHRF) where samples must be handled at the highest levels of containment. 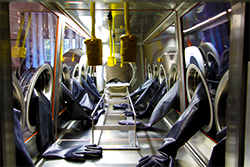 Germfree’s Class III BSCs are installed in high containment laboratories, including BSL-4 labs. Additionally, we have Class III Biological Safety Cabinets in operation at USAMRIID, NIAID, UTMB and PHAC. BSL-3-Ag and BSL-4 laboratories are highly complex projects. All elements of the construction and integration of components must be seamless. Precise calibration of all HVAC systems and controls is critical. Significant completion delays are typical of traditionally constructed BSL-3-Ag and BSL-4 projects. Germfree offers a single source solution for bio-containment projects. We are the only company that designs, engineers and manufactures all of the critical primary and secondary containment systems required for high containment labs. All aspects of the project, from concept to final commissioning of the facility are completed by Germfree, thus eliminating any confusion of responsibility. Our unique modular approach provides a turnkey solution for bio-containment projects. The laboratory is fully operational and Factory Acceptance Tested before it leaves our facility. This mitigates the risk of construction delays and insures that your lab is commissioned and operational in a faster timeline. Germfree Integrated Modular™ is a highly innovative approach that provides new laboratory space, engineered for your specific containment and architectural requirements. All technical (bio-containment) areas are fabricated at Germfree and then shipped to your site. Our engineering team concurrently works with your facility managers to coordinate a final exterior building that allows uniformity with your existing architecture. Additionally the technical/lab space is designed to easily integrate with non-technical areas, such as administrative and office areas. Read More. Class III Biological Safety Cabinets provide the primary containment for BSL-4 Cabinet Laboratories. Our Class III BSCs are engineered to exceedingly rigorous standards for work that involves dangerous pathogens or unknown agents. We have extensive global experience in the integration of Class III BSCs and other critical components into bio-containment facilities (including BSL-4). Germfree offers comprehensive in-house design, engineering and manufacturing capabilities. Our collaborative review process includes 3D modeling and comprehensive assessments of your project requirements by our applications experts. Our F.A.T. (Factory Acceptance Testing) includes all certification and commissioning applicable to your project. Germfree has extensive experience with export controls and international installations. We also provide on-going maintenance and training programs. Our laboratories meet or exceed all applicable guidelines for CDC-NIH BMBL 5th Edition and WHO and all specified requirements for SA registration. Germfree’s modular high containment laboratories are designed and manufactured to rigorous standards for the structural integrity of the facility. Our facilities are comprehensively engineered for structural integrity, seismic and wind activity and floor loading.